Pros: Open-ended missions allow for multiple solutions; built-in physics engine lets kids test and retest their contraptions. Cons: Some kids may struggle with missions and give up, so scaffolded hints would be useful. 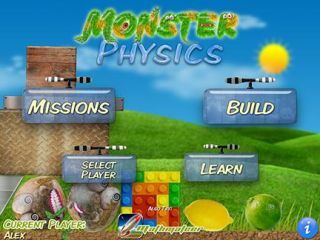 Bottom Line: Monster Physics uses colorful graphics and fun missions to teach kids about physics through exploration and experimentation.